You must complete a 40-hour course of required training. Get It All With Our Full 40 Bundle! BSIS does not require a drug test in order to apply for a guard card. 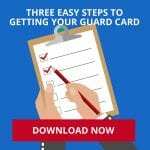 How much does it cost to get my guard card? In addition to the cost of your security training classes, you’ll need to pay for Livescan fingerprinting ($49 + variable “rolling” service fee) and BSIS application processing ($55 for mail-in or online). BSIS usually processes new applications within 15-20 days, but it can be as few as 3-5 days. While you wait for your actual guard card to arrive in the mail, your name will show up on the BSIS website so employers can verify your security guard registration. Can I verify that BSIS received my application? You can contact BSIS at (916) 322-4000. How long does my guard card last? Registration is valid for two years and expires the day after the expiration date on your card. There’s a 60-day grace period during which you can pay a delinquent fee to reinstate your registration. After 60 days, if you haven’t renewed, you must reapply as a new applicant. 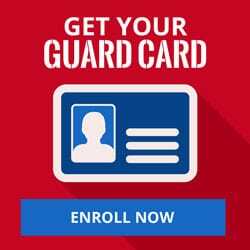 How do I renew my guard card? You must submit a renewal application/letter of request and fees for renewal. Mail the request to: Bureau of Security and Investigative Services. Box 989002 West Sacramento, CA 95798-9002. Application and renewal fees should be submitted to BSIS at least 60-90 days before the expiration date of your card. You need to submit your request as soon as possible so BSIS has time to process it and get your renewed registration back to you. You can keep working for up to 90 days. What if I lose my guard card or it gets destroyed? You can request a duplicate registration by submitting a written request that explains your situation, along with a $25 fee, to BSIS. It usually takes six to eight weeks to get a replacement. I’m moving. Do I have to let BSIS know if I change my address? I’m changing employers. Do I need to send in a new guard card application? 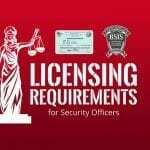 A guard registration authorizes you to work as a security guard for any private patrol operator or in-house employer. 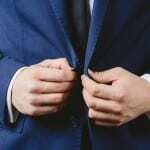 Can I work for more than one person or company? Yes, as long as you’re an employee on the payroll with the proper payroll deductions being made. I’ve completed the PC 832 training. Can I get a guard card? In order to get the Bureau’s registration/permit, you have to complete the Bureau’s training. I’m an emancipated minor. Can I apply for a guard card? There are no exceptions to the age requirement. What if I have a felony or misdemeanor conviction? Crimes of violence and felonies automatically disqualify you from applying to be a security guard in the State of California. For all others, the State considers the circumstances surrounding your conviction and evidence of rehabilitation. Just fill out the BSIS application completely and truthfully. I received a 1203.4 dismissal on my conviction. Do I still need to report it on my application? You must report the conviction. Can a family member give the power to arrest test to the person who’s applying for a guard card (e.g. father to son)? Yes, if they’re licensed or delegated by a licensed authority to do so.